Submitted by lynn on Tuesday, April 14, 2015 - 11:58am. Last year Dennis and I were visiting family in Orange County and decided we were in the mood for sushi. We headed to a restaurant called "I Love Sushi" which Dennis had visited a couple times in the past. Maybe it had been a REALLY long time ago because it had been replaced by EON Sushi. The time was around 3pm so it wasn't too busy for one sushi chef and one waitress. Service was really fast anyway. 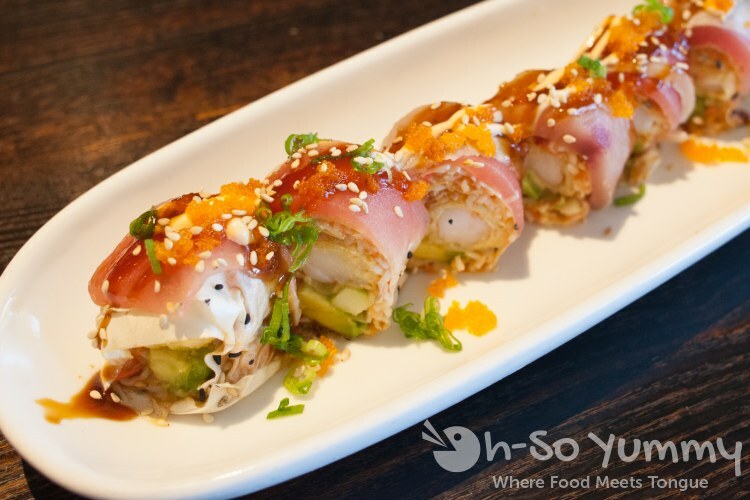 We usually look for rolls based on ingredients or appetizing pictures and ended up with three rolls that were also some of the most popular. Bento Box (10.99) - tuna, salmon, albacore, avocado, spicy crab meat. This one was rice-less and the most interesting roll. The pieces were large plus the sushi wasn't tied together in any way. It was like a fish lasagna with fish layer on the bottom and top with crab mix in the middle. The cuts of fish were nice along the grain, especially the red tuna. This one had a bit of sauce to it so after a while I had to scrape some off. OMG Roll (11.99) - mango (or avocado topping), shrimp tempura, house special sweet chili past, wrapped with fresh tuna. We went 'different' with the mango topping. 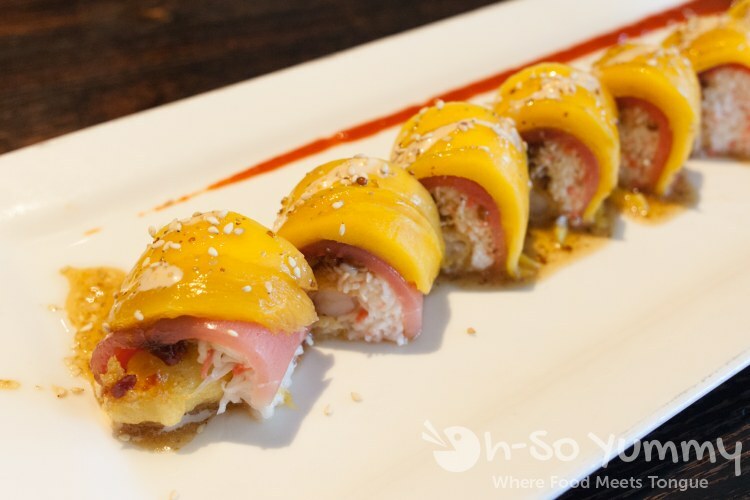 Right away we noticed that the mango and tuna had been used like rice paper on the side and top! Underneath the tuna pieces (which I decided to deconstruct), I found some chili paste-like stuff but the taste stayed clean. There wasn't as much fish as the other two rolls we had. Crab meat and tempura shrimp was inside too. On top of the mango was a very light sauce. We asked the waitress and she said it was mustard! Not some ordinary yellow mustard but perhaps brown or with seeds, though it was very subtle. The tiny bit of spice and sweet paired well together. Also enjoyed the texture of fish and slightly soft mango pieces. 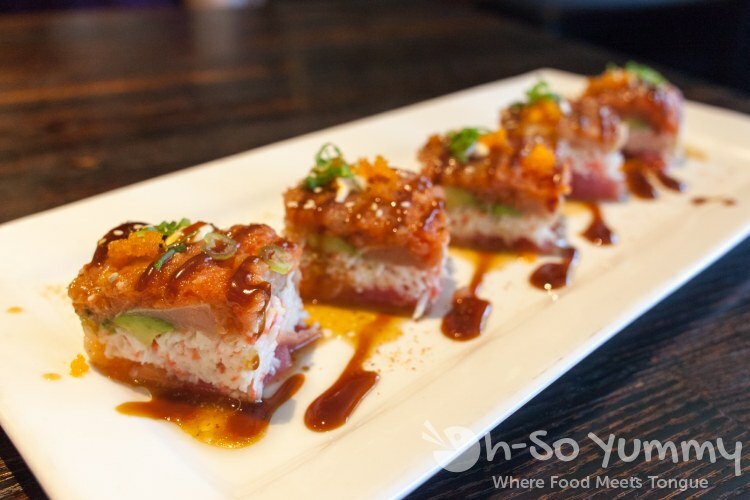 Holiday Roll (10.99) - sweet & spicy tuna, crab meat mix, shrimp tempura, avocado inside avocado, tun on top. It wasn't done on purpose but we realized our third roll was ALSO riceless. I guess it was that kind of day. The outside was wrapped in a thin rice paper and was cut into bite size pieces, the smallest of the three. The fish slices were bigger though, about 1/3 to 1/2 inch thickness! All rolls were pretty good but because we had so many riceless rolls, the first and third rolls with tonkasu sauce made it feel a little bit heavier on the sweet. I usually like sweet but it was a bit overpowering without rice to soak it up! For dessert we got some of the Fried Ice Cream. The batter was kind of thick and undercooked, reminding us of an ego waffle flavor. I would have preferred it a little thinner and fried a little more. It was also a little too doughy. Whip cream is normal but the cherry was like water... flavorless! That was really surprising! Was it washed really well or something? Anyway we did enjoy our visit but I hear that there's new staff so the rolls may be a little different for your visit. Brazil sounds so cool. I like both mango and avocado so could go for either. I think it's hard to find a good riceless roll so the ones here look pretty good (and affordable!). Did you say they put tonkatsu sauce on the rolls? Or was it more an eel sauce? I hate admitting that I sometimes dig sweet eel sauce on rolls. 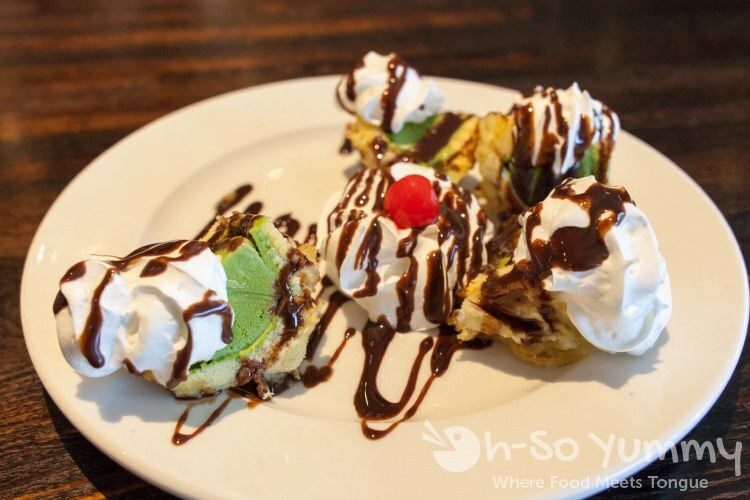 I couldn't imagine fried ice cream being too doughy - sounds awful. At least the green tea ice cream looks good. Hmm, I probably wrote the wrong thing. I keep forgetting what it's called but I do believe it's that sweeter eel sauce. I'll update it thanks! As for the ice cream, it should have been fried more! Wow, these look really different from the sushi that I'm used to (i.e. covered with mango)! Hope they open up a place in San Diego (hint, hint)! I've had mango on a roll in San Diego before (Go Go Sushi next to HMart in Mira Mesa comes to mind) so it's definitely out there if you look!